The Peak Performance organic coffee seems like a pretty good cup of joe. It has a 4.5 star rating on Amazon, along with the badge for Amazon's Choice. There are a lot of great things behind this brand of organic coffee. So, let's see what we can dig up. The Peak Performance Organic Coffee is what is called high altitude coffee. It is grown at a higher altitude which results in a more dense coffee bean. Not only does this mean the coffee is of a higher quality grade, the high altitude also tends to give it more antioxidants. These are great for you body as they help to fight off illnesses. The Peak Performance Organic Coffee is only taken from a single origin. This is opposed to blended coffees. Even though "blended" sounds nice, it means that the coffee beans were taken from multiple locations. Blended coffee is also much harder to guarantee the safety of. One of the beans could have been contaminated. If that is the case, all of the coffee is thus contaminated. Peak Performance organic coffee is only sources from the Guatemalan Highlands. So you can be confident that you are getting pure, quality coffee. This is very important for companies that claim their product is organic or otherwise. 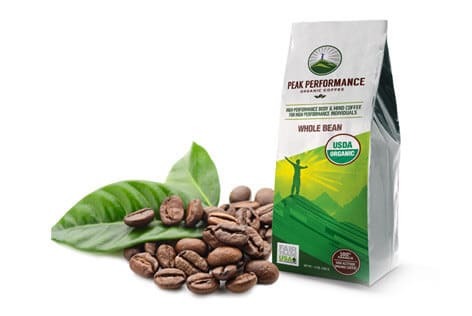 Peak Performance organic coffee is in face USDA Organic certified. This badge is very important because without is, there is no real way to know for sure if the product is organic or not. Many companies can just claim their product is organic, but with the seal, you know for sure. Along with the USDA seal, Peak Performance also has a Fair Trade USA seal. This is another important seal because it shows that by buying this product, you are actively helping the livelihoods of the workers and farmers. In addition, it is also 100% Arabica coffee. The company places that seal on the bottom right corner of the bag. Peak Performance organic coffee comes in a variety of different types of coffee, depending on your likes and tastes. The standard Peak Performance is Medium Roast Ground coffee. But on their Amazon page, you can also select their Dark Roast, along with choosing weather to get the whole bean or the coffee grounds. If you prefer to grind your own coffee, then get the whole bean. If you favor convenience over much else, grab the grounds. Either way, Peak Performance has something for whichever taste preference. Peak Performance mainly a coffee company, however they also sell other products relating to keeping you healthy. For example, along with their organic coffees, they also sell Superfood Powder, Hydrolyzed Bone Broth + Collagen Protein Peptides Powder, various vitamin supplements, and even packaged Paleo Granola snacks. They conduct all business through Amazon, however they do have a website. On their website, you can find information about their coffee, supplements, powders, and even buy an ebook. Their ebook is called "How to Make The Healthiest Cup of Coffee". It goes through the steps that regular coffee brands take to produce their coffee, and tell you what they do differently. One really cool thing this company does is that with each purchase, Peak Performance also supplies a child at risk of malnutrition with vitamins for a whole year. They have a partnership with Vitamin Angels that does a 1-for-1 donation, with each item purchased from Peak Performance. High-Altitude grown coffee. This allows for a much higher quality grade coffee than most commercial brands offer. Not only that, high-altitude coffee is also naturally rich in antioxidants, which are great for the body. Peak Performance organic coffee has only a single origin. This means that the beans were grown and taken from just one place. That place is the Guatemalan Highlands. This brand of organic coffee comes with plenty of reassurance. USDA Organic Certified seal, Fair Trade USA seal, and 100% Arabica seal. All to assure you, the customer, that you are not only getting high quality coffee, but also that what Peak Performance is claiming is completely true. They make available 2 different variations of their high-altitude coffee. Dark Roast, and Medium Roast. In addition, you can also choose between whole bean or grounds for each of the variations. Peak Performance Organic Coffee is a bit pricey. This is common for organic coffees because most of the time their coffee does not have a high availability like commercial brands. On top of that, the way they grow their coffee is expensive as they do not use pesticides or fertilizers. If you are looking for a good all around every morning coffee, this is probably your best choice. The availability of Dark Roast and Medium Roast gives some freedom of choice, depending on your taste. In addition, with Peak Performance, you have peace of mind, knowing that the coffee is in fact organic, provides better help for workers and farmers, as well as 100% Arabica. So you really know you are getting a great cup of jo' with this brand. The Peak Performance organic coffee brand is a great organic coffee. They give you plenty of assurances, allows you to help those in need, and you get a great tasting cup of pure fuel. Right now you can pick up any of the variations of Peak Performance for $19.95 on Amazon. For more information regarding the other top 10 best organic coffee, visit Green and Growing. Here are some top questions that I found for people seriously considering buying Peak Performance Organic Coffee. What is the weight of the bag? You get a 12 oz. bag from each purchase. How is the coffee processed? It is wet processed. A newer method of removing the four layers surrounding the coffee bean. What is so good about High-Altitude grown? The higher altitude results in more antioxidants, along with a better overall flavor and body of the coffee.